In today's VETgirl online veterinary continuing education blog, Dr. Nicole Heinrich DVM DACVD from McKeever Dermatology Clinics discusses the disease dermatographism. What the heck is this? Do you have any dog patients that seem to get itchier after being bathed? Consider the possibility of dermatographism in these individuals. Dermatographism is a condition where mechanical pressure induces mast cells in the skin to release the contents of their granules. This results in increased itching and sometimes hives. 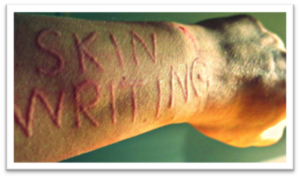 The most dramatic examples of dermatographism are in humans and the pictures below speak for themselves. Some dogs also need an antihistamine or steroid the day prior to, the day of, and the day after grooming. 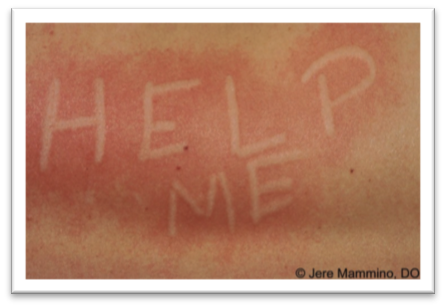 The associated allergy may also need to be addressed. When in doubt, educate your pet owners about this and be aware of it yourself.